Looking for new construction around Mesa? While scoping out newer developments seeking new construction, having a knowledgeable Realtor at your side is important. is here to help you navigate the myriad of new homes today to find one that's right for your family. In real estate, negotiation is always an option. However, with new construction, it depends on the builder and how long the home has been on the market. Developers in new additions like to keep prices near their asking point because buyers already in the area expect new construction to be comparably priced to what they already purchased. (You'll appreciate that same courtesy if there are undeveloped lots near the home you eventually purchase!) But, depending on how far along the project is and the local market, builders have been known to allow a few concessions. For example, if a home has been on the market a while and the builder is deeply invested, then you have some room. The same goes for show or model homes that have been sitting for a while. However, if a home was just completed, don't count on being able to get a deal. 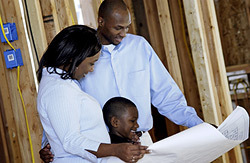 You can always ask for assistance in other ways when purchasing new construction. For example, closing costs are one way for you to save without lowering the price of the house. The same goes for amenities - ask for things appliance upgrades, a garage door opener, a sprinkler system or landscaping, or an extended home warranty.That can go the other way around, too. If upgrades are already in the contract, see if you can get the builder to remove them - you might be able to install them later yourself at a savings anyway. Finding you a new home that meets your family's needs and matches your budget will be my #1 objective. Give me a call at 480-844-0600 to start the search for your new home today.